You see the term “social media” thrown around all the time, but what does it mean for both individual users and whole businesses? Organizations that understand the importance of social media have a unique advantage over other businesses in the same industry, be it a way to attract more consumers or a way to protect against common security threats that find their home on these websites. Social media can be considered any website or service that is used to interact socially with other people. Some common examples include Facebook, Twitter, LinkedIn, and even Instagram. All of these services have common ground in regard to features that allow people to communicate or learn more about one another, whether it’s in the form of a terribly-worded Facebook post or a bite-sized glimpse into someone’s soul via Twitter. LinkedIn allows business professionals to learn more about each other by providing information about their work history or current situation, which can be quite helpful for learning more about a company or a prospective client. Social media is generally used more for the former, though. It’s likely that your employees have at least one account on a social media platform, so it’s important that your organization understands what it means for the purposes of security. One of the biggest issues regarding social media is that it can provide hackers with a way to get into your organization’s network--or, rather, trick your employees into providing information that could aid them in their attack. Hackers can create fake accounts where they can impersonate people you may know. They then use this process to weasel information from your employees such as usernames or passwords. 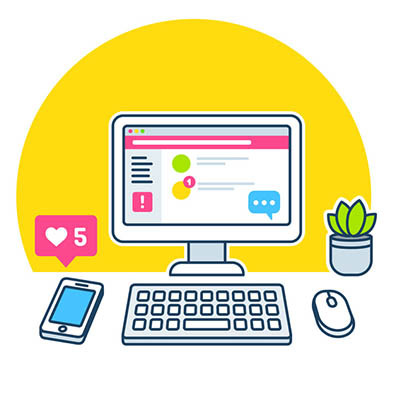 You need to make sure that your employees are aware of the telltale signs of social media attacks so you know they won’t be an issue for your organization. Many organizations have turned to social media as a way to directly interact with consumers. Take, for example, Verizon. If you tweet at their support account, there is a solid chance that they will address any problems you might be having with your mobile service. You can use social media in this regard to directly reach out to customers and get their feedback about your products or services. How does your business use social media? Let us know in the comments, and be sure to subscribe to our blog.